Schools visiting NorthBay must provide the people outlined below. We will ask you to designate these individuals ahead of time upon completion of your registration form in order to ensure that you have the best possible NorthBay experience. And if you’re a visual learner, please watch the “Step-By-Step” video provided below! Your school will designate one person as the Trip Organizer – Responsible for providing NorthBay with all necessary documentation, a completed registration form including entire 6th grade class list, a signed NB Reservation contract, and a certificate of liability insurance. The Trip Organizer also provides student and cabin counselor lists with cabin assignments to NB. NorthBay cabins sleep 12 total, with 2-3 shower and bathroom stalls in each. 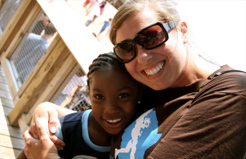 The Trip Organizer is responsible for assigning students to cabins with participating parent chaperones. NorthBay does have an alternative option in providing NorthBay counselors to stay in cabins at night but this does need to be established well in advance with the NorthBay School Coordinator – Heather O’Rourke. There should also be an additional list with the teacher housing list. Please use the links below to access these forms. One staff person (preferably a nurse) to collect medications, health forms, and medication forms. Health forms are due to NorthBay at least 2 weeks prior to arrival. Medications need to be collected on the day of the trip and delivered to the NorthBay nurse. Please see medication guidelines on following page. If applicable, Survey Coordinator responsible for follow-up student surveys. If your school is selected as part of our follow-up study, this Coordinator will oversee the administration of our survey to all 6th graders three months following their visit to NorthBay. We will notify you if your school is participating and provide you with necessary reminders, materials and instructions. Please note that this study is extremely important for quantitatively demonstrating the success of our program; results will be shared with your school. Trip Organizer – organizing liaison between school and NorthBay responsible for compiling & sending the following necessary documentation to NorthBay three weeks prior to trip: cabin assignments including adult cabin leader names, Health Information/Consent forms for all students attending, Medication forms, teacher room list. One NorthBay Medication form needs to be completed for each medication and a new form is needed if a dosage or time of administration changes before your child arrives at camp. If the student already has a medication form on file with the school, a copy of that form may be sent in lieu of the NorthBay Medication Form. These forms are due to NorthBay at least 2 weeks prior to arrival. Medications not previously given at school must have a NorthBay Medication Form completed and on file at least 2 weeks prior to arrival. Over-the-counter medications include Tylenol, Motrin, Calamine lotion, Benadryl, and other medication you can purchase at a pharmacy without a prescription. The form must be filled out completely by the person designated in each section. An adult must bring the medication to camp and give it to the Wellness Center staff. No camper can keep medication (other than self carry medications) in his/her cabin or give medication to him/herself. PLEASE COMMUNICATE TO PARENTS, NO MEDICATIONS ARE TO BE PACKED IN STUDENTS’ LUGGAGE. ALL MEDICATIONS MUST BE GIVEN TO THE MEDICAL COORDINATOR AT THE SCHOOL AND THEN DELIVERED TO THE NORTHBAY NURSE. All medications with self carry/self administering approval will be redistributed to students after they arrive at camp. Prescription medications must be in the original package with the pharmacy label intact and over-the-counter medications must be in the original container (box, etc.) with the manufacturer label intact. For example, inhalers must be in the box with prescription label and pills cannot be in a weekly pill organizer. Samples from a doctor’s office cannot be given. Medications cannot be expired or more than 1 year past the original prescription date. With a Prescriber’s authorization, insulin, rescue inhalers, and epi-pens ONLY can be carried by the camper and self administered with an adult’s supervision. These medications need to be in the control of the camper or counselor or locked in the safe provided in each cabin at all times. If the student wishes to self-carry inhalers that they bring a second inhaler to keep in the Wellness Center for quick access in an emergency. NorthBay’s TurnAround Program (ISS) is designed to take a student out of the regular NB classroom when he/she is having trouble behaviorally, and help them receive a substantive experience which will get them back into the mainstream NB adventure. Our goal is to keep them at NorthBay all week if possible, and we will try hard to keep every child. This experience directed by the NB Dean of Students, will make use of a vast menu of modified NB curriculum, disciplinary writing, service participation, and much more. We want all of your sixth graders to come to NorthBay, even those you might be inclined to keep at school for disciplinary reasons. Please do not prevent kids from coming to NorthBay as a form of punishment as we find that this divides the class and has a negative impact on the ongoing change we affect in schools. 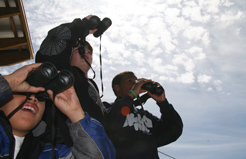 We need your most outgoing & adventuresome teachers to accompany children on this excursion. Teachers who are willing to participate in outdoor classes with the children whether it be hiking, roaming the wetlands, handling animals, etc. It is our experience that a lack of participation on the teachers’ part sends a similar message to the children, so please come with an open mind and attitude. Classes meet all over camp. Students and teachers should come to class dressed appropriately for the weather. We will be outside even in cold, wet weather! 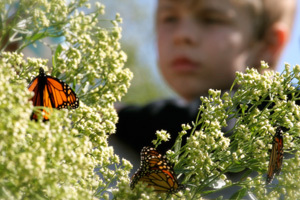 On average, students spend 75% of their class time outside. There is a 5 minute warning horn previous to each meal! This horn beckons everyone to the Dining Hall where students line up by gender on the sidewalks between The Bowers Center & the Dining Hall (Weather permitting). Teachers and chaperones are asked to assist NorthBay staff in lining students up into three straight lines prior to entry. Do not bring students to the Dining Hall before the first horn! There are always programs/announcements/music from the stage, before the assigned individuals go for the food. NorthBay takes time with meals to make them really fun, full of surprises, relationship oriented, nutritious, and tasty. Meals are served family style, and each table will have one student/adult per meal, who will go to the kitchen to pick up the food. Students will stack their table during clean up prior to dismissal. Chaperones and teachers should spread out and eat meals with the students, guide conversations to process their experience, and supervise the food service and clean up. Students are not required to eat every food item. In order to prevent waste, please do not take food you will not eat. Adults closest to spills are requested to go to the kitchen and ask for appropriate clean up materials. If someone in your group has dietary needs due to a health condition or allergy, please bring it to NorthBay’s attention. Visiting teachers are integral to the NorthBay program. 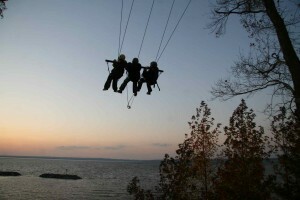 Every teacher will be attached to a NorthBay class and may co-teach or support (even at the Ropes Course). We encourage your active participation in the class and with supervision and discipline. We also encourage your participation in the evening program which typically lasts for 75-90 minutes each night. This time focuses on character education and its integration with daily classes. Activity time for kids in the late afternoon and in the evening after the program is at your discretion though it is a good time for interaction with your kids, and allows you to participate in some of the very cool options offered by NorthBay in climbing walls, zip lines, swimming, and boating, as well as both NorthBay stores. If a school has not provided enough cabin leaders, or chaperones leave camp for any approved reason, then we will ask visiting teachers to step into the breach and function in those supervisory roles at night and during free time. NorthBay also observes a “two person rule”, whereby no adult is ever alone with a child. Students must be under adult supervision at all times while at NorthBay. No corporal or physical punishment is permitted while at NorthBay. No swearing, derogatory or obscene language will be tolerated, especially toward our student guests. All visitors not arriving with a scheduled group must register at the Bowers Center office, and wear the weekly wrist band. If you observe anyone on campus without this wristband, please notify NorthBay staff. Summary: You have a role in classes, meals, and the evening program, with an opportunity to enjoy free time along with your students.